Are burgers your favorite item on any menu? If your answer was a resounding “YES!”, then this round up of the best burgers in Coral Gables is perfect for you. I challenge you to try every burger on the list and rank them to compare our findings. Bookmark this page and make a plan to visit each of these locations serving the most delicious hamburgers in the area. Let me know how they stand up to your burger-loving standards. Let’s get started! 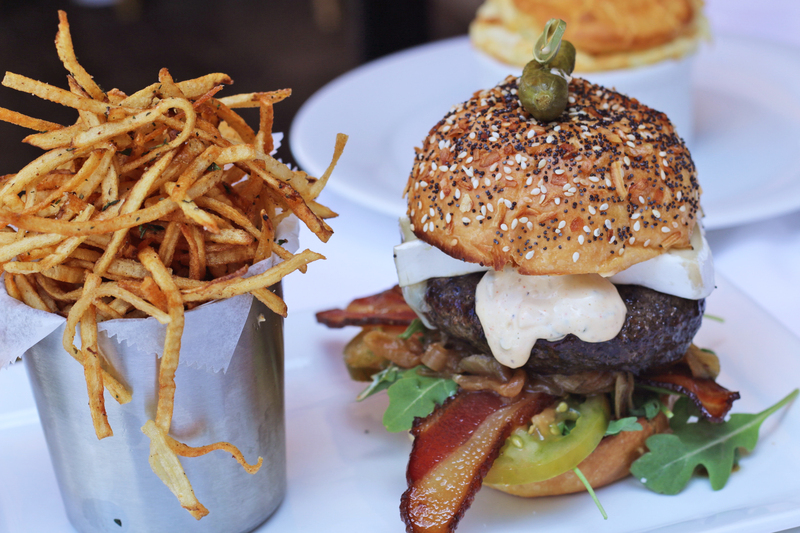 At the top of our list is our very favorite burger in Coral Gables. It’s a recent addition to the Coral Gables foodie scene as it was just added to Le Provençal’s menu. Le Burger has huge chunks of brie, smoked bacon, green tomatoes, a fat patty full of flavor, and a French “Big Mac” sauce – served on an “everything” brioche bun. It’s amazing! Pro tip: it’s served medium rare by default so don’t forget to mention how you like your patty cooked. Le Provencal is located at 266 Miracle Mile, Coral Gables. The Shula’s Burger from Shula’s 347 is full of chargrilled flavor. The patty is made with short rib, brisket, and top sirloin, making it super tasty and juicy. Pro tip: Make sure to leave room for dessert. Their banana chocolate chip bread pudding is a must! If you’re already at Shula’s you might as well, right? Shula’s 347 Grill is located at 6915 Red Rd, Coral Gables. I love the taste of Pincho Factory patties. They are cooked to perfection and their seasoning takes me back to my favorite childhood burger cooked over a grill. The Pincho Burger is topped with lettuce, tomato, onions, cheese, potato sticks, and a secret pink sauce. The matchstick fries give the burger a nice crunch and the pink sauce adds a nice flavor that ties all the ingredients together. Pincho Factory is located at 30 Giralda Avenue, Coral Gables. The Local’s House Cheeseburger is insanely delicious! With an onion ring filled with cheddar cheese & Mississippi sauce it’s a mix of oozing yummyness and crispy textures. This burger is on their lunch menu. You won’t find it on the dinner menu, but you can still order it as a secret menu item. The Local Craft Food & Drink is located at 150 Giralda Avenue, Coral Gables. The Nica burger is an Angus beef patty topped with chimichurri, queso blanco fried cheese, sweet plantains, pineapple vinegar slaw, and jalapeño cream sauce. The sauce is not spicy; but its flavor ties all the different sweet and savory ingredients together perfectly. The burger is served on a buttered, toasted, brioche bun. This burger is delicious with the perfect combination of sweet and salty with fried queso blanco, the tasty meat patty and the plantain. The pineapple cole slaw gives it crunchy texture. The bun is soft and lightly toasted. Swensen’s is located at 1586 S Dixie Hwy, Coral Gables. Shake Shack knows what they’re doing when it comes to the yummy trifecta of burgers, shakes, and fries. You can taste the quality of the ingredients in the first bite of the juicy ShackBurger. The melted cheese, lettuce, tomato, and ShackSauce are all the toppings you need for a tasty meal. Added bonus, the shake shack fries are crispy on the outside and fluffy on the inside. You need great fries to thoroughly enjoy your burger experience – and Shake Shack definitely delivers when it comes to french fries. Shake Shack is located at 1450 S Dixie Hwy, Coral Gables. The Mac and Cheese burger at Swensen’s is a dream come true for mac and cheese lovers. If you consider yourself one of these wonderful people (I do), then you need to head over to Swensen’s and try it. The Mac and cheese burger is assembled with the following ingredients: macaroni and cheese, smoked gouda, applewood smoked bacon, hamburger patty, fried mac and cheese on the bottom, and cooked to order pepperjack cheese sauce. When you hear the list of ingredients you think to yourself, “this is too much”. The truth is, it is; but in a good way. It’s definitely very rich and I recommend sharing it because you might end up needing a nap after eating the whole thing (or even just half of it). PRO TIP: Bring your stretchy pants. With patty made of short rib, brisket and smoked pork blend, the Swine Burger earns an honorable mention on the list. Toppings include homemade dill pickle, thick-cut house smoked bacon, lettuce, tomato, American cheese, and Swine special sauce. Swine Southern Table & Bar is located at 2415 Ponce De Leon Blvd, Coral Gables. The BurgerFi cheeseburger is the bestseller for a reason. It perfectly hits the spot with two Angus beef patties, American cheese, lettuce, tomato and their secret sauce. BurgerFi is located at 136 Miracle Mile, Coral Gables. The Barnyard Burger from The Bar has a patty made of brisket, ground beef, and smoked bacon. Yes, there is bacon in the patty! Then they build the burger with crispy bacon and a fried egg. The barnyard burger also includes black bean chicken chili on the side but you can add it to your burger too. The Bar is located at 172 Giralda Ave, Coral Gables. Love your pics & writing <3 thanks for sharing! Thanks for the recommendation! We’ll try it out and see how it stands up to the burgers on the list. The only one I’ve tried is Pincho. Will have to check out the others. Thanks for the list. Oh lucky you! I LOVE discovering new places. Have fun! I need to visit Coral Gables! A great selection you’ve listed here. Yum ! Can’t wait to try Pincho Factory, I’ve been meaning to go there!